Henry E. Stokes enlisted September 22, 1862 at Waynesville with Capt. Hopkins. Pvt. 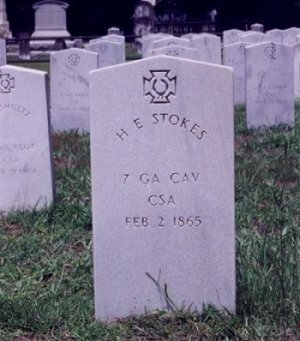 Stokes was in Co. A, 24th Battalion, Ga Cav until, through consolidation of units, he was transferred to Co. G, 7th Regiment, Georgia Cavalry. Pvt. Stokes was shown as being present on all roll calls through October, without a horse in September. He was in Jackson Hospital at Richmond November 16th through the 30th for rheumatism. On December 22nd after being captured and in Yankee hands, he was admitted to a hospital in Savannah with ascites. From there he was sent to General Hospital on January 16, 1865 with intermittent fever. At the age of 41, Pvt. Henry E. Stokes died February 24, 1865 of chronic diarrhoea at Post Hospital, Savannah.